The function of modern chairs is not limited to practicability. 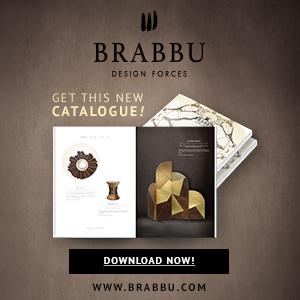 At the same time, they play an essential role in displaying design style as well. Especially for hospitalities, choosing the right modern chairs will be helpful for attracting customers. In addition, the selection involves diverse aspects, including the place where the chairs are put, the overall design style of the hospitality and so on. In this article, we select 8 incredible hospitality design projects and hope you can get some inspirations about how to choose the right modern chairs for a hospitality design project. COCOCO restaurant has a luxurious bar and a glamorous dining room where modern Russian cuisine is served. The project interior design was made by Home Collection, a Russian interior design company and furniture supplier. 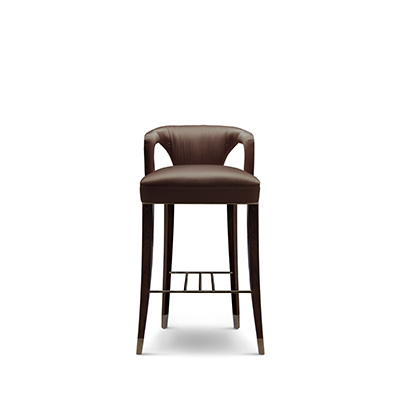 These stylish bar chairs, named as Nº20, come from Brabbu. The fabric and a beautiful and standing out velvet make Nº20 distinguished and unique. The Langham Hotel in London was Europe’s first “Grand Hotel”. And the project is designed by Richmond International, an interior design company focused on hospitality projects. Armchairs used in the hotel is DUKONO Armchair. DUKONO suits perfectly in a modern home decor. With the synthetic leather fabric, DUKONO makes a statement in this hotel. Blue Living is a luxury store in Berlin, Germany that sells design pieces from internationally renowned interior design brands. The name of this chair is ZULU, means prestige or personality. Just as the name shows, Zulu dining chair combines prestige and personality. On the one hand, its structure and color give the prestige that only mid-century modern pieces have; on the other hand, its soft velvet gives more personality to the design. The Providence Hotel in Paris has a long history and has been renovated in recent years. The armchair used here is MALAY. 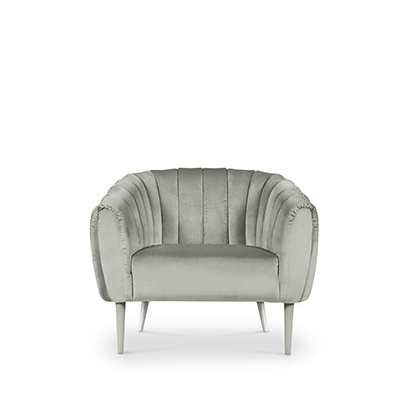 The graceful green velvet armchair with a mystical soul that will fulfill the entire room set with energy from nature. At the same time, it matches well with the wallpaper, bringing a fresh feeling to the room. This restaurant locates in Sweden and is designed by Stylt Trampol, a Norwegian design group with a passion for creative concepts and engaging experiences. Chairs used here are IBIS Dining Chair and IBIS Bar Chair. 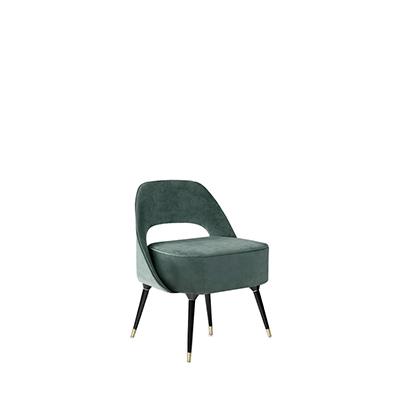 Inspired by an elegant bird, ibis, both IBIS dining chair and IBIS bar chair are elegant and stylish with all the refinement of velvet. Fairmont Hotel locates in Hamburg, Germany. After renovation, it starts to apply Nº20 Armchair into rooms. Depends on the color schemes of each suite, Nº20 Armchairs are customized into 6 colors. And the wooden legs make it more elegant in a way that perfectly fits in harmony with the ambience décor. Sydney Rowing Club is one of the best spots in Sydney to enjoy a cold drink with friends. MAA Armchair is placed in this club. Maa is borrowed from a name of the language, which has a harmonious vowel. The combination of its shape with its singular color and the twill delicacy brings the detail that will make every room speak harmoniously. Emirates Hills Villa is a signature project by Nikki B Interiors based in Dubai, UAE. 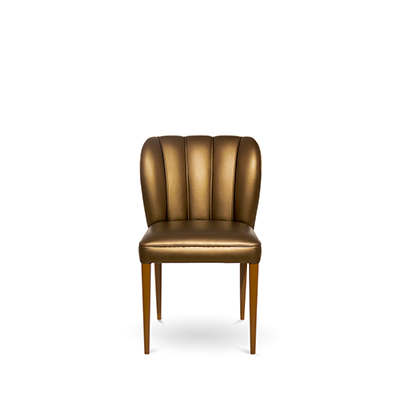 This chair combined leather with wooden legs, which makes itself luxurious yet classic. These chairs will be suitable for every stylish place.